The Texans collect tight ends like they are going out of style. 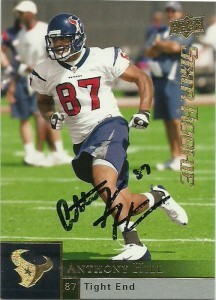 Anthony Hill is a devastating blocker out of NC State taken in the 4th round of the 2009 draft by the Houston Texans. He earned 2nd team ACC honors his senior season and at 6’6″, 277 make him a Antonio Gates sized target. Unfortunately Hill caught Swine Flu his rookie season and although he has recovered, has not seen any extensive playing time outside of the preseason for the Texans since being drafted. He also needs to improve his speed off the snap and improve on his durability to warrant more play time by the team. Anthony is also buried on the depth chart behind Owen Daniels, Joel Dreessen, James Casey, and Garrett Graham.